2018 Bridebook wedding report, technology is becoming an integral part of the wedding celebrations and 11% of couples hope to ‘wow’ their guests with social media content and advanced technology. Photographs are a central part of the wedding celebrations and an average of 3,400 photos are taken at each wedding; how would you feel about a robot photographer taking some of these photos? Here are three key three reasons why a robot photographer should be at the top of every couple’s wedding planner. Weddings can quickly become boring, especially if they focus more on tradition than creating a truly unique experience. If you want to have the wedding of the century, then you need to think outside the box while planning. A robot photographer is a great way to make your big day stand out as guests are unlikely to have seen anything like it before. It’s a more personal form of fun photography, guaranteed to make guests feel special, as the roaming has facial recognition technology which is able to detect guests and ask if they would like a photo. Photo booths and Magic Mirrors are great fun at weddings but they have been around a few years now, With a robot photographer, the photo booth comes to you, encouraging your guests to take more photos and document more amazing memories. With a robot photographer, you have the option to email, print, text, or even post the photographs straight to social media, which is a much more convenient solution. These innovative devices are the ultimate in customisation and the front screen can display any text or video message that you desire; this is ideal for couples with a specific wedding theme, which they can then make the robot’s display screen adhere to. Guests can even alter how their photo is taken and there are a variety of filters and frames that they can add to their photos to make them extra special. Looking for a robot hire service? We can be relied upon to supply an out of this world photography robot that wedding guests will rave about for years to come. Contact a member of our team to talk through your robot hire options. Planning a wedding that is both magical and entertaining for guests can be an almost impossible task. One lucky couple, however, managed to make their special day just about perfect with the help of a little artificial intelligence. 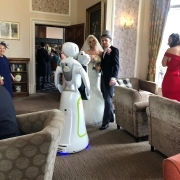 On Sunday, 7 April the UK witnessed its first ever wedding that featured an Eva photography robot. A machine with amazing capabilities, Eva is essentially a humanoid robot designed to interact with event guests. It is able to recognise guests’ faces with ease and subsequently ask them whether they would like a photograph taken. Once they have agreed and the robot has taken a beautiful shot, the resultant photos can be printed instantly or shared on social media using Eva’s intuitive interface. 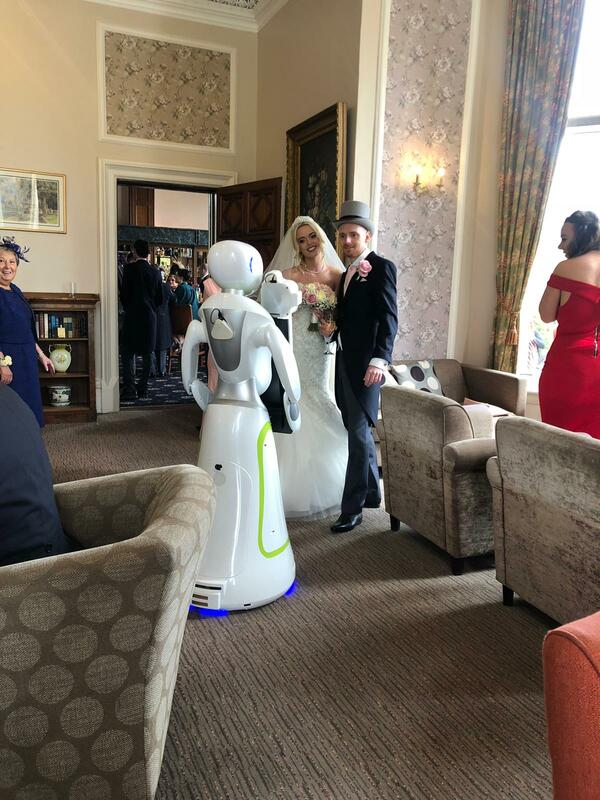 As you can imagine, Eva’s debut at the recent wedding was a wonderful novelty for guests, allowing them to enjoy the robot’s futuristic feel and capturing memories that will last forever. 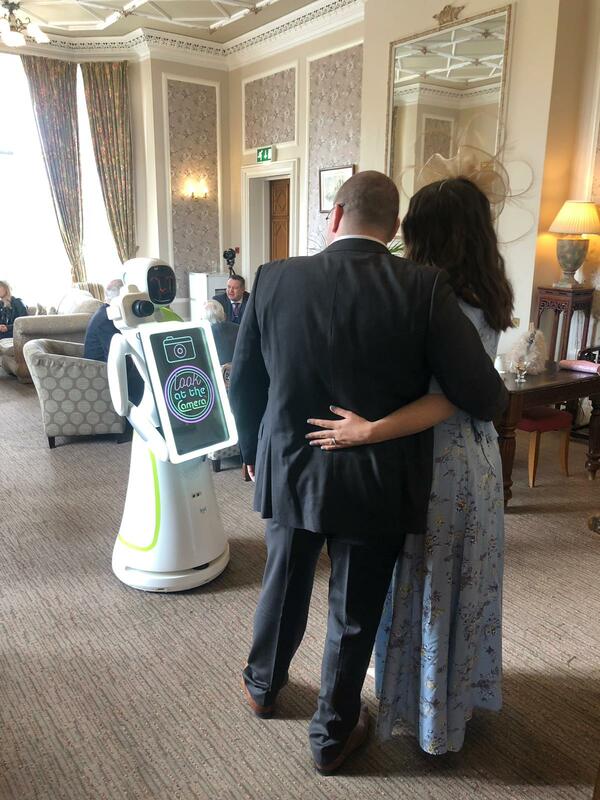 What’s more, the robot’s ability to roam freely meant that guests did not have to get up out of their seats or squeeze into a photobooth to obtain some lovely photos – great news for those who were a little worn out from the excitement of the day. Of course, Eva is not designed to replace traditional professional photographers, one of whom was in situ at the recent wedding. Rather, the robot is a great alternative to traditional photobooths, which are slowly going out of fashion. 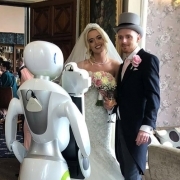 Hiring both a traditional photographer and a photobooth robot like Eva means newlyweds can look back on crisp, professional shots as well as more candid, fun and cheeky photographs taken with the robot’s help. Generally speaking, the Eva photography robot is perfect for encouraging people to interact as it provides an excellent talking point. 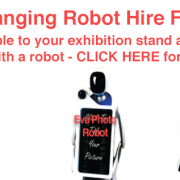 Indeed, conference and trade show organisers have been using robots such as Eva for a few years now, as they are great for encouraging customer interaction and offering memorable experiences. In the context of a wedding, a photobooth robot can help bring together friends and family members of the happy couple that have never met before. This is particularly helpful if you’re planning a big bash, as nothing encourages social interaction quite like a few silly photos. Traditional photobooths have been a wedding staple for many years now, but they are starting to seem a little dated. No matter how many goofy props you provide guests with, the standard booth simply won’t cut it anymore. A photobooth robot is a fantastic way to bring your wedding into the current decade. If you’re interested in robot hire for your upcoming wedding, give us a call today. What can service robots do for your business? Most of us have dreamed of a future where we get to interact with robots. Not only could these robots do all the boring chores we need doing, but the robots of our imaginations can also function as a bodyguard, nanny, personal assistant and substitute parent when needed. Films such as the Star Wars series with feisty R2D2 and the adorable C3PO, not to mention the movie Big Hero Six’s cuddlesome Baymax, only confirmed the popularity of the trusty robot sidekick. If you cannot wait for the future to arrive, why not get a jump start by investigating the new and exciting world of service robots? 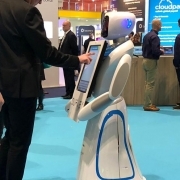 Primarily designed to help with the smooth running of events and exhibitions, you can hire a robot waitress, enlist the help of robot photography or have information robots guide your guests to their tables or show them around the facilities. Robot photography is a cutting-edge innovation, as the robots work by facial recognition to find your most honoured guests, and can ensure that plenty of photographs are taken of them at your exhibition or gala event to boost your publicity. What’s more, robot photographers can glide quietly around the room, snapping shots of your guests that will be more candid and natural than they might otherwise be with a human photographer breaking into their conversations or attracting their attention when trying to be surreptitious. The results can then be used for future successful marketing and promotional campaigns. Having robot waitresses is a boon to any business looking to provide a unique experience for their guests while also wanting to create a slightly otherworldly ambience in order to launch and sell their own cutting-edge product. Being waited on by a machine that has a humanoid appearance will ignite a sense of childlike wonder and marvel in your guests, and really add to the level of interest in your company’s innovations. These service robots can be programmed with customised information to aid business opportunities of all types. If you are thinking about setting up a company, using robots or otherwise, you can arrange for purchase or rental of the service robots that best suit your needs. https://www.servicerobots.com/wp-content/uploads/2019/02/LOGO-service-Robots5-300x61.jpg 0 0 Chris Wood https://www.servicerobots.com/wp-content/uploads/2019/02/LOGO-service-Robots5-300x61.jpg Chris Wood2019-04-08 19:43:202019-04-08 19:43:20What can service robots do for your business? A robot waitress may sound like a sterile addition to any restaurant or dining experience, but they are taking the hospitality world by storm. Initially, restaurant owners and chefs were apprehensive about the automated technology, but as robot waitresses are becoming more popular, those who have invested in them are reaping the benefits. A robot waitress is not designed to steal human jobs. On the contrary, its purpose is to assist staff in restaurants and venues to allow for a more efficient and streamlined service. The top benefits of investing in a robot waitress are listed below. One of the biggest issues for people in the hospitality industry is the level of manual labour a role can entail. Whether it is carrying heavy trays and plates or constantly clearing appliances, manual labour can take its toll on any person’s body. A robotic waitress is designed to carry heavy plates and glasses. The availability of having a labour assistant is not only increasing employee satisfaction in the workplace, but it is also reducing employee injury and costly workplace health and safety payouts. The addition of robotic waitresses in a venue means that the existing staff have more time to focus on customer service and customer interaction. The freeing up of resources means that more orders can be taken behind bars, more customers can be engaged with, and the higher the venue’s reputation for service will be. Robotic waitresses are built with advanced technology and are designed to work with humans, not against them. Their programming and lasers ensure they can be conscious of the environment around them, which makes them a low-risk addition to the business. Their service is reliable, and they will perform the exact duty that they are programmed to do. Robotic waitresses are proving to be a handy addition to restaurants and venues that experience a high number of orders at any one time. For any business that is considering investing in advanced technology, it is always best to try before you buy to find the best fit. Highly advanced robotic waitresses can be hired for one-off events, or for long periods of time through UK renowned robot hire company, Service Robots. 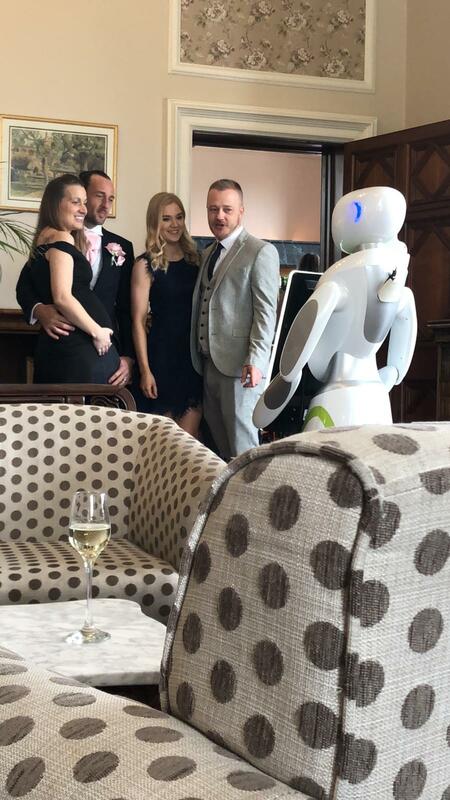 Eva the Photography Service Robot captivates attention wherever she goes – and she certainly did recently when she caused a stir at the Bank Restaurant on behalf of the Birmingham PA Forum. She proved to be a huge hit with attendees, and it’s easy to see why! Eva the Photography Service Robot is designed to command attention, thanks to her large 23.8-inch touchscreen which enables event attendees to have their photographs taken. Afterwards, pictures can be printed out at the nearby printing station – or guests can take advantage of Eva’s built-in social media integration to upload the photos straight to their profiles! Eva is particularly great for marketing because both she and her accompanying printing station can be fully branded, depending on a company’s needs. At this event, Eva was able to use her facial recognition technology to recognise guests at the Birmingham Bank Restaurant. This allows her to be even more interactive, and really make visitors feel like they’re receiving a warm welcome. Naturally, she commanded the room, helping the Birmingham PA Forum to host a truly memorable evening. Eva looks futuristic, but she couldn’t be easier to configure to the specific needs of a business. She has multiple cases depending on the specific event she’s required for – which means she’s a compelling addition to any event whether being hired or bought outright. Eva is easy to use, allowing guests to simply navigate her features through her intuitive menus – all controlled through the large touchscreen. Infra-red sensors allow her to precisely map any new venue she happens to visit, which allows her to navigate the floor with ease – avoiding collisions with obstacles and attendees. Eva benefits from consistent performance updates to ensure she’s as responsive as possible, as the guests at the Bank Restaurant found out! 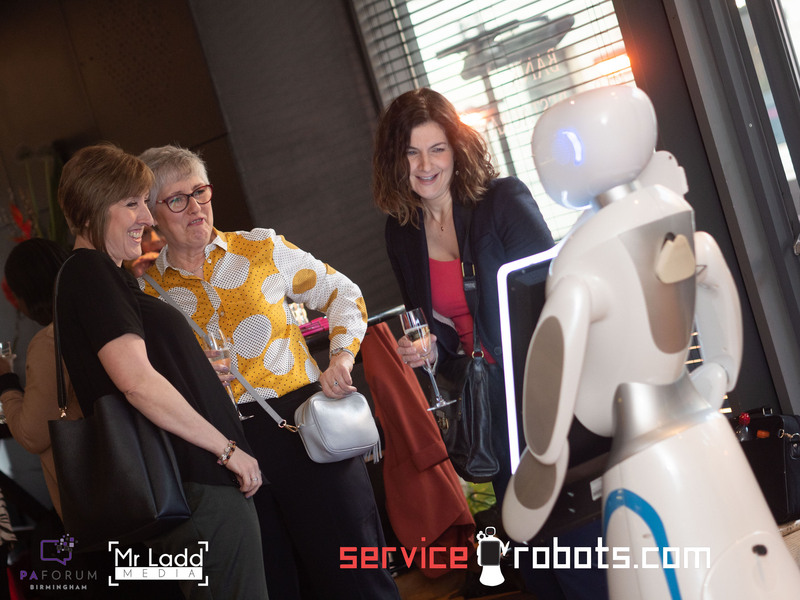 If you’d like to hire, or purchase, Eva to help make your next event a huge hit – be sure to contact the friendly and experienced staff at servicerobots.com. We can help you further understand how Eva can benefit your business. Servicerobots.com have released a new robot which provides photo and survey capabilities in one. 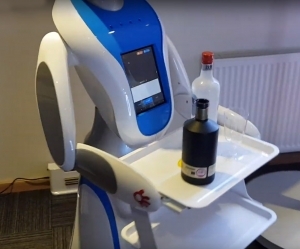 Eva, the new service robot, is able to move around a venue and locate guests using an advanced facial recognition system. She then asks if guests would like their photo taken, providing lots of fun options, like a magic mirror, to make the photos really memorable. The photos can be easily uploaded to social media or printed out at a print station in the room for guests to take away with them. Photobooths and magic mirrors have traditionally been popular entertainments at parties and special events, but the industry has grown stale, with new releases offering very little in the way of novelty. Magic mirrors which are different shapes and static photobooths that offer different functions just don’t stir up the enthusiasm that they once did. With the launch of Eva, a robot which provides both photography and surveying services, Servicerobots.com are shaking up the industry and providing customers with a new and exciting prospect in robot hire. Eva the robot is able to provide both traditional photographs and enhanced images with lots of entertaining options for guests to choose from. She has a large colour touchscreen which makes her even easier to interact with. As she roams around the room, guests are far more likely to get involved with her than with a traditional photobooth or magic mirror. Eva is also an asset at corporate events as photos can be branded. Added to this, the surveying capability of the robot makes it a valuable tool in data collection. Event management is often cited as one of the most stressful professions. And for good reason. The profession involves juggling multiple tasks, writing and checking countless lists and ensuring that everything runs smoothly, safely and to the agreed deadline. Unsurprisingly, more and more event managers are utilising AI technology and streamlining their event setup and running procedures by choosing to hire a robot. There are countless benefits to hiring a robot to help you host an event, and the main ones are discussed below. With everything required to run an event, accidents can sometimes happen. Whether it’s running into someone with a tray of canapes or straining a muscle while heavy lifting. Hiring a robot to complete many of your event’s manual labour tasks is a safe and practical solution to minimise the chance of accidents and even dodge potential medical or legal costs. Robots not only lessen the risk of human error, they also operate on highly advanced technology, so you can be assured that the process the robot is programmed to do will be completed perfectly. Robots are not susceptible to human emotion or distraction. They are programmed to do a set task, in a designated amount of time, and will do just that. There won’t be distractions from their phone ringing, they won’t find themselves caught up in conversation and they definitely don’t require refreshment breaks. Automated robots rate significantly higher when it comes to reliability than human manual labour. Robots who perform event tasks will always deliver a quality service. With precise programming, such robots will consistently perform repetitive tasks (and without complaint!). Repetitive tasks ensure that every process is completed to the same high quality, ensuring all event attendees are happy with their experience. What’s more, the risk of human error or missing process steps due to tiredness or distraction is eliminated. Contrary to popular belief, robots do not pose a threat to existing jobs, they simply have the potential to change the future of existing jobs – and often for the better. Not only will resources be freed up, but those who previously performed manual labour jobs will have the ability to take on more stimulating roles such as interacting with customers, clients and guests at events to enhance their experience and enjoyment. Servicerobots.com supply a high calibre of robots for event hire. From robotic waitresses to advertising robots, service robots provide an AI solution for every event manager’s needs. The photo booth industry is about to be shaken up by the arrival of Eva the photography robot. Eva is a mobile photography robot from Servicerobots.com and she is part of the robot revolution that is sweeping the rental industry. Photo booths have been a popular rental for events for many years and with good reason. Guests love to record the memories of that special party, wedding or celebration and many businesses have grown up around the industry. Eva, however, leaves static photo booths standing. As she roams around the room, she uses advanced facial recognition to locate people and ask to take their photos. As Eva is not static, but interacts with guests, she provides a more enjoyable and memorable service than a photo booth. As all the photos can then be uploaded and instantly shared on social media, or instantly printed at a print station in the room, she is also more versatile. The service robot industry has been gaining momentum recently due to new advances in technology, and robots now routinely carry out many automated tasks in industry. Improvements to systems like facial recognition mean that robots are now able to interact with people on a more sophisticated level, making them much more desirable for events and an impactful option for advertising. Because they are too expensive and specialist for most people to purchase for an event, robot hire provides many business opportunities. A company spokesperson for Servicerobots.com commented that “Robot hire companies are really starting to take off as a small business”. It’s easy to see why photography robot rentals would be a lucrative new business to invest in. As well as their obvious appeal for celebrations such as weddings and parties, photography robots are very effective for promotions as well. Eva can display branded videos, company logos and give altered greetings, all geared towards the customer’s brand. Rental businesses must evolve as technology progresses and the rental needs of customers change. Demand for hire of devices like photography robots is on the rise and the opportunity is there to supply this fascinating new field. Service robot hire is an exciting way forward for new business ideas. As well as the photography robot, Servicerobots.com also provide waitress robots and information centre robots. For more information about the range of service robots available, visit www.servicerobots.com. Why is it a perfect time for your business to start renting robots? The robot revolution is well and truly here – technology is progressing at a consistent pace, which means robotics are only going to become a bigger and bigger part of our lives. As more and more businesses begin to understand how robots can help them, the demand is sure to continue to rise. This is why now’s the time for your business to get in on the ground floor in a blossoming industry, by offering robot rental. Your business stands to benefit from extremely generous rental rates, due to the relatively new technology that’s found in the majority of commercial robotics. This sort of new technology always carries with it a proportional increase in cost, which businesses are often willing to accept in exchange for being ahead of their competitors. A tailored rental plan can allow you to enjoy interest from a variety of businesses, from multi-national corporations through to single-employee SMEs. Robots are currently expensive to buy outright, which means rental is going to be the only practical avenue for most businesses – as such, you’ll have a ready-made pool of clients. There’s something about robotics that captures the imagination and interest of everyone – which is good news for you as a robot rental specialist. When considering any viable business venture, it’s important to consider the long-term popularity, which is why renting robots makes so much sense. As time goes on, they’re only going to become more widespread and desirable. As more businesses take advantage of their usability and practicality, the whole industry will grow. This spells great things for your ability to turn a consistent profit long into the future. Robots offer businesses the opportunity to save money while increasing efficiency – that’s a pitch that will never become undesirable. Renting robots to businesses is such an attractive proposition because you have to do very little promotion or convincing to make them desirable. A robot that is used for promotional purposes at events, expos, or in business premises is always going to cause a stir – from other businesses as well as from customers. This means that your clients will be keen to rent your robots out on an ongoing basis, because that sort of reliable publicity and “buzz” is difficult to find elsewhere. This means that your rental prices are always going to be consistently profitable – for example, ServiceRobots.com are able to rent out robots at a rate of £1499 per event because of their practicality and ability to generate a stir. It’s easy and accessible to start the process of using your business to rent robots. With a wide variety of robots available to suit the needs of a host of different clients, you’ll find it simple and straightforward to generate a real stir and start making profits. Robots are only going to get more popular, so it makes sense for you to be the one helping businesses near you enjoy their benefits. Contact ServiceRobots.com for more information. https://www.servicerobots.com/wp-content/uploads/2019/02/LOGO-service-Robots5-300x61.jpg 0 0 Chris Wood https://www.servicerobots.com/wp-content/uploads/2019/02/LOGO-service-Robots5-300x61.jpg Chris Wood2019-03-21 15:36:322019-03-22 13:32:32Why is it a perfect time for your business to start renting robots?